Natasha Trethewey. Photo by Sharon McGauley. Natasha Trethewey is the author of three collections of poetry, including Native Guard, which won the 2007 Pulitzer Prize, Bellocq’s Ophelia, and Domestic Work, which won the inaugural Cave Canem Poetry Prize. A native of Mississippi, a member of the Dark Room Collective, and the Phillis Wheatley Distinguished Chair in Poetry at Emory University, Trethewey’s work often shifts from the personal to the historical, confronting subjects that include the legacies of racism in America and her own experiences as a person of mixed race growing up in the deep South. 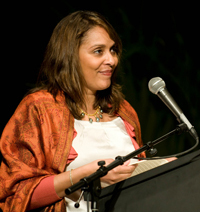 In 2012, Trethewey was appointed Poet Laureate by the Librarian of Congress. This recording is available for noncommercial and educational use only. All rights belong to the author. © 2010 Natasha Trethewey. Used with permission from Natasha Trethewey. Today we heard that you had been named Poet Laureate, an historic moment. So I gathered my poetry class together and we listened to you reading from this reading at Key West where I heard you. But I first heard you at the Dodge Festival on a cold and rainy day. I loved your poetry so much I rushed to buy Native Guard and later you autographed it. You are truly an inspiring poet.